Providing treatments now - Pioneering for the future. BrAMS was established in December 2008 at Frenchay Hospital. The centre is the first of its kind in the UK providing dedicated research, treatment and therapy for those with multiple sclerosis in the South West. Following the closure of Frenchay Hospital in May 2014, the BrAMS service transferred to Southmead Hospital Bristol where the multi-disciplinary team continue to provide first class clinical care and up to date clinical research where patients can access a wide range of treatments. BrAMS offers a unique service, offering support, information, clinical treatment and therapy and research to people across Bristol and the South West. Over 4,000 people visit the unit each year. 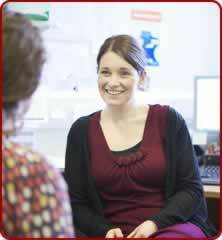 Expert, unrivalled clinical knowledge in multiple sclerosis and associated neurological conditions. A dedicated specialist MS nurse team offering a range of specialist nurse led clinics, a telephone helpline services and invaluable support to MS patients their families and carers. A specialist physiotherapist service offering instant access to information, treatment, exercise, balance rehabilitation including vestibular rehabilitation, spasticity reviews, mobility aids, orthotics provision and a monthly joint orthotic clinic. An intravenous suite allowing access to daycase IV steroids, which are often used to treat patients in times of relapse or those with severe spasticity. To access any of these services, (if not already known to the unit) we require a letter of referral from your GP. Please note we are unable to provide non-evidence based therapies such as hyper-baric oxygen, acupuncture, homeopathic or herbal remedies. Support BrAMS through Southmead Hospital Charity.